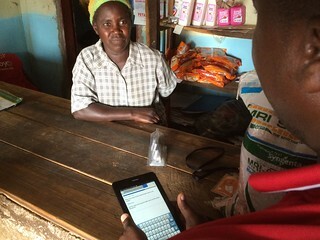 We started using Android tablets during support visits to Kit Yamoyo retailers in mid-2014 (see Take a Tablet). This did two things. Firstly, it helped standardise these visits; to make sure that key things were checked and asked: Was the product displayed well? Did the retailer have a poster displayed? 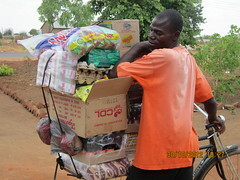 Secondly, it collected key information such as stock levels, sales, prices etc. Data started accumulating at a rapid rate, but analyses took a long time to do and so were infrequent. Even when these analyses were done they tended to be presented to project management staff and not to the people on the frontline using the tablets and collecting the data. 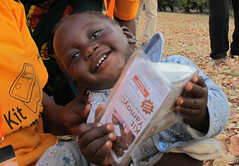 So, we sought help from DataKind who “harness the power of data science in service of humanity”. In short, DataKind link data scientists with organisations like ColaLife to help with data issues. DataKind introduced us to Abbott Katz who is an Excel genius and the only Spreadsheet Journalist I am aware of. Anyway, Abbott worked with me to produce our first dashboard which was released in Jul-15. We made the dashboard more granular – the first dashboard analysed things by Province where multiple teams may be working – we needed to analyse by District where individual teams operated. The fieldworker meeting happened on 18-Feb-16 and was reported here. Looking back now this was a transformational event. For the first time, frontline staff became clear about their precise role and how their performance was to be assessed. To coincide with the workshop, Release 3.0 of the dashboard came out, showing performance by team (District). Click on the image to see Release 3.0 full-size on Flickr). 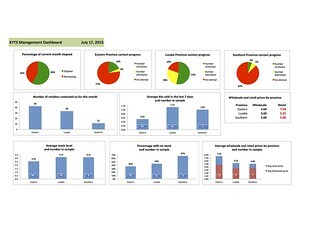 Since then, the dashboard has been produced every Friday and the majority of them have been published online here: https://colalife.org/dashboards. 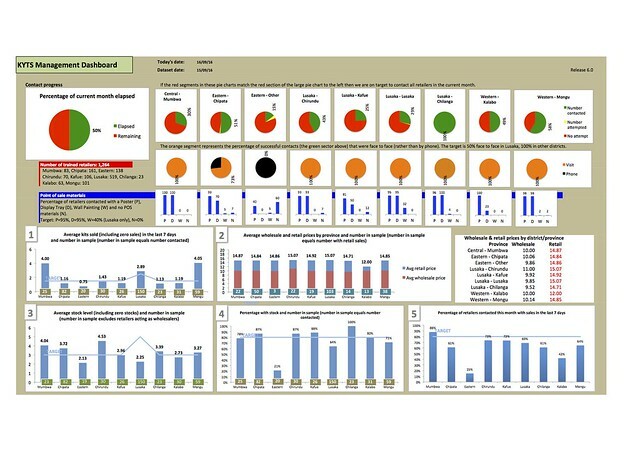 The dashboards have had a huge motivational effect, with the different district teams comparing their performance and seeking to learn from others who are performing better than than they are. 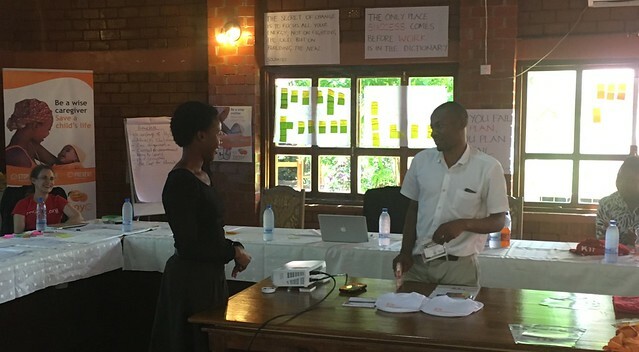 A key development has been the spread of ‘route planning’ across all districts as a means of meeting retailer contact targets (meeting all retailers face to face every month, or every other month in Lusaka). The release of the dashboard on Friday mornings has become ‘an event’ for everybody. Even the Lusaka driver comes into the office at around 10am and says, “Is the dashboard out? How did we do?”. We are now on Release 5.0 of the dashboard, which analyses the percentage of contact with retailers that is face-to-face (as opposed to by phone) and the presence (or not) of point of sales materials. Click on the image to see Release 5.0 full-size on Flickr). Although Release 5.0 (immediately above) is more sophisticated than Release 3.0 (above Release 5.0), the bottom two rows show the same KPIs. In both cases the blue lines are the targets. At a glance you can see how things have dramatically improved. Thanks are due to the frontline staff who have risen to the challenges given to them, to Ralf Switi for guiding us in what we needed to be doing and to Abbott Katz for providing the means to measure performance and feedback to those who can make the difference (the frontline staff). For those wanting more information on the dashboards, a detailed commentary on the latest dashboard is here. 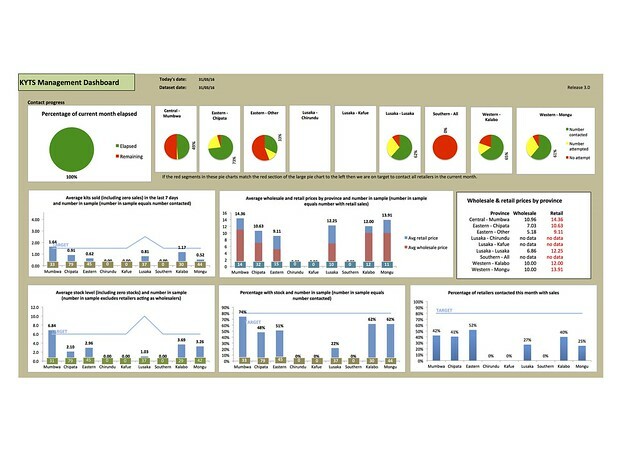 We are also able to provide the dashboard Excel workbook on request (please leave a comment or email act [at] colalife.org).